With the rising popularity of shows like Flea Market Flip, savvy shoppers are seeing the value in combining a clever imagination with simple restoration techniques. From estate sales to swap meets, you can find plenty of items for your home that, with a little TLC, can find new life and purpose. For example, many metal items, such as patio furniture, table stands, and light fixtures, can be completely revitalized and reinvented through the process of powder coating. As a customizable, durable finish, powder coating transform worn or rusty metal items into vibrant pieces that are as good as new. 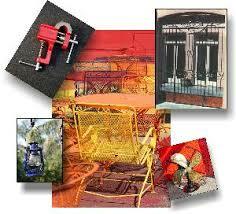 Powder coating is a much more durable finish than paint, and resists rust, chipping, and scratches. Automotive powder coating is popular for both protection and customization, while powder coating furniture is very popular among designers and restoration enthusiasts. Regardless of the genre, power coating can help transform old, worn items for a very affordable price. Suddenly, that flea market find becomes a revitalized steal with a simple powder coat. At Electro Tech Powder Coating, we provide custom powder coating services for the San Diego area, including motorcycle powder coating, household goods, and much more. We can handle items both large and small, and our many years of experience makes us the go-to powder coating provider in our area. We invite you to contact us to learn more about powder coating, and to discover how we can turn what looks like trash into revitalized treasure.